With every new year comes new resolutions, whether it’s hitting the gym more, being kinder to your wallet, or eating healthier. The secret to achieving your goals is to place yourself in an environment that encourages success – and so we’ve created the Salad Bowl to help you break your bad diet. You are welcome. 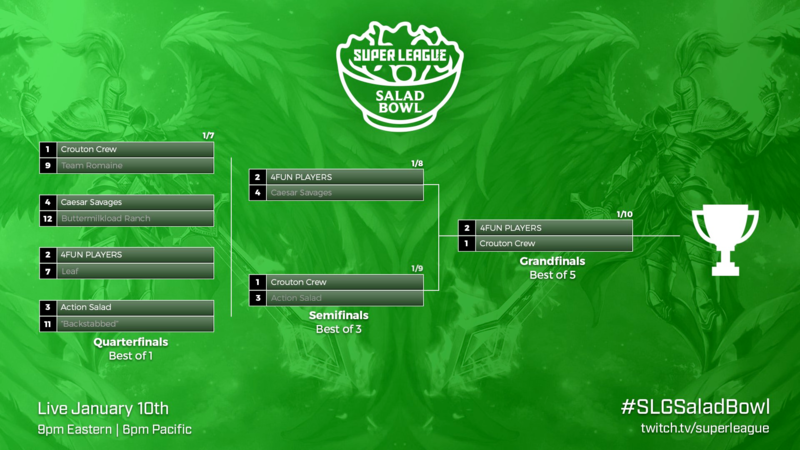 The Salad Bowl is our League of Legends tournament for the Super League community. We allowed our players to form their own teams with one simple rule: each player on a team must be from a different city. From there, we tossed them on the Rift together and followed the final matches on Super League TV. While the Salad Bowl began with twenty teams, the Quarterfinals narrowed it down to the top eight. In the end, the Crouton Crew, Caesar Savages, 4FUN PLAYERS, and Action Salad came out as victorious over Team Romaine, Buttermilkload Ranch, Leaf, and “Backstabbed”, respectively. Seeing as the top seeds all won, there was no upset… that is, except for the fact that our poor casters never got the salad they ordered with their pizza. There were no surprises in the Semifinals as both of our two winning teams claimed a decisive 2-0 victory over their opponents. 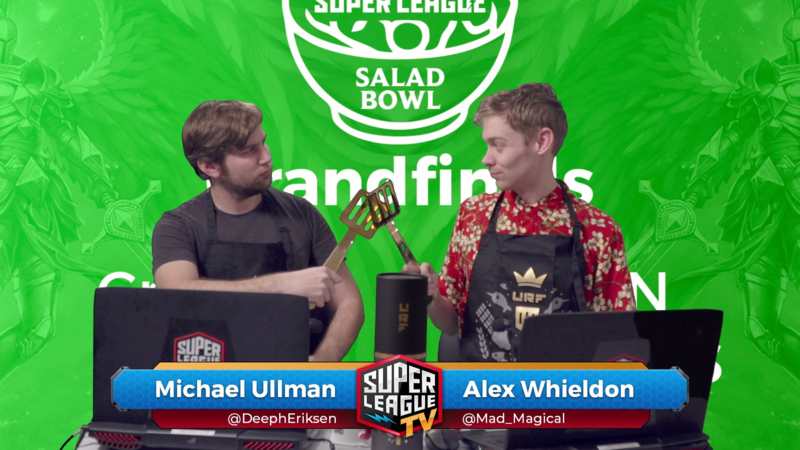 Our beloved Action Salad may be able to successfully execute Super League events, but they could not execute the Crouton Crew. Meanwhile, The Caesar Savages were betrayed (backstabbed, you could say) by the 4FUN PLAYERS who were indeed, not only playing 4FUN as they secured their spot in the Grandfinals. The Grandfinals came down to Crouton Crew and 4FUN PLAYERS, a fierce matchup in which half of all players previously played in Red Bull Super League All Stars tournament. While all bets were on Crouton Crew throughout the tournament, there was one little issue – a missing Kembo. Could the 4FUN PLAYERS (and the one additional un-fun one) use this to their advantage and top all the other salads? Not quite. With ur adorable coming to the rescue and subbing in for Kembo until he was able to return for game five, our favorite sautéed bread squad took home the victory. Thanks to our amazing Chefs – Hopop201, Prxphecy, Tyrell, and Warrior5642 – and all the teams who participated in our first ever Salad Bowl. 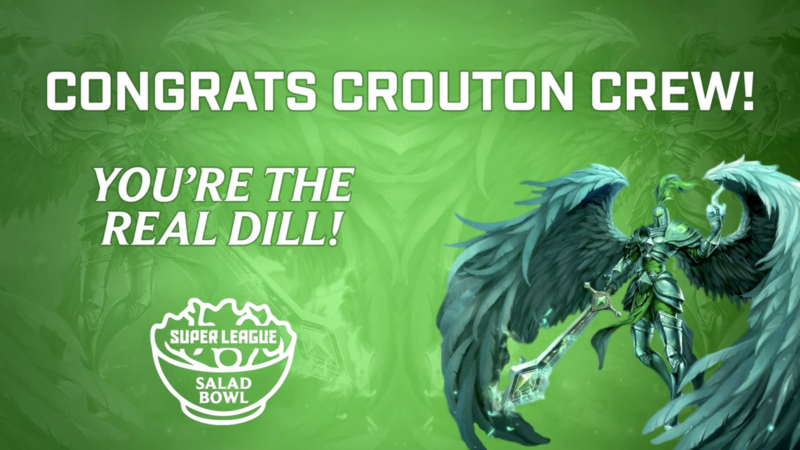 Congrats to Crouton Crew, the winners of our very first Super League Salad Bowl! With a dream team made up of TC porsche (HOU), Achilles great (NY), Kembo (TB), Barmithian (DC), Twis (BOS), and ur adorable (MIA), we all knew they were the ones to watch – and they confirmed our suspicions.